Locksmith Princeton - Want To Protect Your Retail Store From Burglary? Here Are 5 Tips! 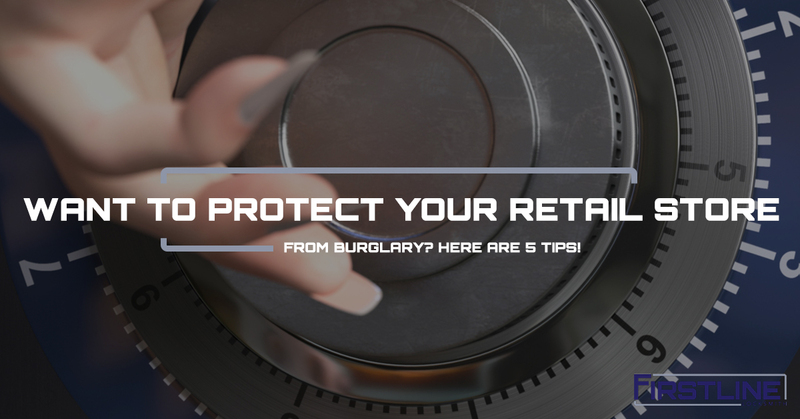 Want To Protect Your Retail Store From Burglary? Here Are 5 Tips! Did you know in 2015 US Businesses lost more than $800,000 in property losses due to burglary? What’s more, one out of eight burglars from the same data set reported picking locks or using a key to gain entry into the retail business. This begs the question, how do you protect your business if criminals can simply manipulate a door lock or use a stolen key to get inside? At Firstline Locksmith, we intend to answer that question and more with this blog post. You’re not alone when it comes to securing your retail business and protecting it from break-ins. You’re a business owner, and you understand that it’s important to protect your business assets. One way to do this is to add commercial door locks and deadbolts onto your retail store doors. Keep in mind, though, that most insurance policies require proof of forced entry to pay out any claims. If a criminal were to break into your store, you need to make it as difficult as possible for them. Generally, a double-cylinder deadbolt lock and a pin tumbler cylinder lock are two great choices. However, contact your local locksmith in Princeton to discuss which security measures will work best for your retail business. Typically, retail business owners only secure the primary entrance into their space. This means that the rear door to their business is an easy target to break into due to inadequate door locks or other security measures. Furthermore, a rear entrance to a retail store usually offers more protection from being seen and light, which make it a prime target for break-ins. Set a door lock rekeying regimen. As a retail store owner, you will experience turnover with your employees. When people quit or get fired, you need to get their store key from them. If you cannot attain the key you gave them, it’s time to rekey your door locks. What’s more, rekeying your door locks routinely makes it so that any copies made by current employees unknown to you is ineffective for future crimes. Not sure how often to rekey your retail business door locks? At Firstline, we would suggest rekeying your locks every few months, if not more frequently. A high-security business safe is an investment into the future of your retail business; it’s a place to store cash so that employees and potential criminals cannot access it. Furthermore, consider storing your safe behind another securely locked door. This makes it even more difficult for those wanting to break in. Safeguard your retail business with an after hours security system like an alarm, camera, and more. This will increase security, and deter many of the criminals that would target your business otherwise. Not sure where to start with your retail business security? Firstline Locksmith has been servicing Princeton businesses for years. Contact us today!